RAM Online — N. American Roof Management Services Ltd.
To create an effective roof management program, an extensive amount of roof related information must be gathered, reviewed and stored for future reference. This information is used as the basis for making educated roofing decisions, developing budgets, and planning for the short, intermediate and long terms. Our Roof Asset Manager database is available to our clients online and the client information housed with the Online program is always up to date – reflecting all currently known roof data. 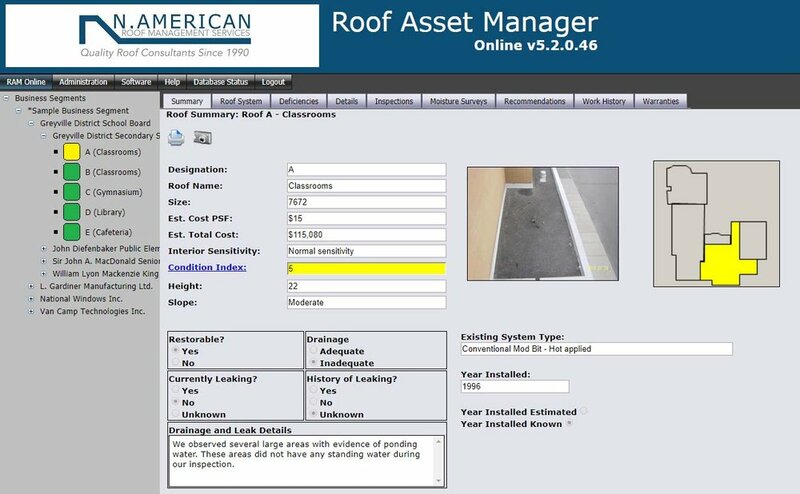 Using this advanced Roof Asset Manager software and other means, we effectively communicate with our customers and develop long-term roof management programs that meet their present and future roofing and budgeting needs.